Last night I couldn't sleep and I decided to research Leap Years on the internets because I honestly never understood the point (I don't know, I must have missed that science lesson in elementary school or something.) 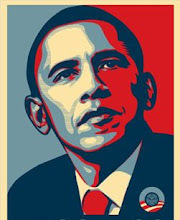 And it turns out they're totally necessary, to keep up with the earth's revolutions around the sun. This leap year is particularly special, because it's the first February with five Fridays since 1980. The next time this will occur will be the year 2036. The Radar Brothers are special too. They have a great new album out called Auditorium. Peasant's Damien DeRose has the acoustic troubador stylings of many of the excellent artists that have come before him, but it would be unfair to categorize him merely based on precedent. Peasant's new album, On the Ground, may look and feel like something familiar, but it shines with a confessionary storytelling that is refreshingly his own. You can read a Gothamist interview with DeRose from earlier this week, and tonight he's playing a show in New York. Peasant's new record, On the Ground, was released this week. I sat through the entire Oscars ceremony, almost by accident. I was writing and there's a TV right next to my computer, so it became my background noise for the evening. I'm glad I did, this year's awards show was more sincere and unfiltered than most of the others I've seen. The list of winners were largely internationals which I thought was pretty awesome, and everyone was wearing red for some reason, which I thought was really strange. 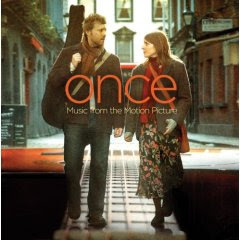 Glen Hansard and Marketa Irglova won the Best Song award for one of the many brilliant songs they composed that filled the year's most captivating film, Once. This is a slightly different version of the award winning song, it is from The Frames' album, The Frames being Glen's band. Anyway, when they gave their acceptance speech, Glen got a chance to give his thank yous, but they cut the mic off when it was Marketa's turn. So when the program returned from commercial break, host Jon Stewart gave Marketa her fifteen seconds to say what she wanted to say. She said that this award meant something not just for her and Glen but for the other struggling indie musicians out there with a dream. I'm paraphrasing, but it was really nice. On my way to the doctor's office, we saw a small blue car on the shoulder of the freeway, with a small fire cooking in the exhaust. Thankfully the passengers were able to run to safety on the side of the road. Traffic slowed, as it usually does anytime there is another man's misfortune to jeer at. The flames went about their business, slowly working their way up towards the roof of the car. It was almost something out of a movie. I can't believe I haven't talked about my fabulous fiction writing class here! One of the few plusses about not having a 9-5 schedule (at the moment) is that it affords me the opportunity to take a random writing workshop in the middle of the morning on Mondays. The class is so rad, the other week our instructor (who is also a really awesome author in her own right, do check her out), read Dr. Seuss poetry to us and we discussed the inherent rhythm of language and words - trochees and iambs were in full effect. I was going to bring it up in class, but I didn't want to seem all 'teacher's pet'-y so I thought I'd share with you because it's a really cool song. I am officially beyond excited about this record. Nicole Atkins' new video for "Maybe Tonight" reminded me of some other videos I really like, mostly because they all employ the same highly effective and popular music video maneuver - "the walking/dancing/singing ensemble but I'm just going through my regular daily routine you see" maneuver. If you didn't think there was a technical term for it, there it is friends. Lightspeed Champion's "Tell Me What It's Worth"
Julieta Venegas' "Eres Para Mi"
Lightspeed Champion's new album, Falling off the Lavender Bridge, is really kind of awesome, and Julieta Venegas recently released a Best-of Compilation doncha know. And Nicole Atkins' Neptune City has set up permanent residence in my CD player. This song from Guitar Goddess Kaki King's forthcoming album, Dreaming of Revenge, has constantly been on repeat around here for weeks now, and I thought it fitting to post about it on this Lovers' Day. The amorous guitar and lyrics emoting over an unrequited love tug at the heartstrings just so. Dreaming of Revenge is due out next month, and Kaki is currently on tour. So according to BV, the cease-and-desist order has been lifted, and Oakland DJ Amplive is now able to share the fruits of his In Rainbows remix studio experiment with the world as nature intended. I really like the collab with Too $hort on the track, "Nudez," the lyrics have been retooled a bit and it's really great. I know I've mentioned that this is my favorite song from the album, but who knew the remix would be my favorite too? The song doesn't veer that far away from the structure of Radiohead's original, except for the pulsing percussion and the sporadic electric guitar riff that makes itself known throughout the song. Bay Area soul singer Codany Holiday manages to upstage Thom Yorke on this one, dare I say his temperate falsetto reminds me of a young Luther? I think I will. You can download another song by Holiday from his Myspace page, and download the entire Amplive Raindayz album here. I was surprised that the Grammys turned out to be quite the jump-off last night. This was my favorite performance, Rihanna performing with newly reunited funk pop super group The Time. I love love love her new hair cut, it's fab. Other highlights, Kanye made me cry when he sang a song for his late mother, real talk. And I thought Amy Winehouse was in rehab but she sure did perform on the Grammys. You know, her hit song about never going to rehab. But on to music. 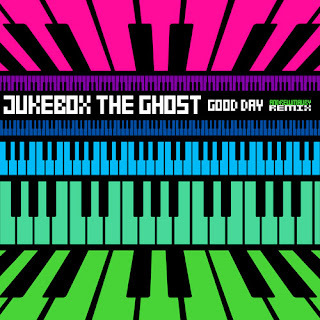 My Life is a Stereo's friend Andrew Maury has made some more remixes, including a reworking of Jukebox the Ghost's piano-pop declaration, "Good Day." It's already a brilliant song, but the voice distortion brings it up a notch. I know I've mentioned this before, but do check out Andrew's own band, Magic Hour. They really are too cool for school. 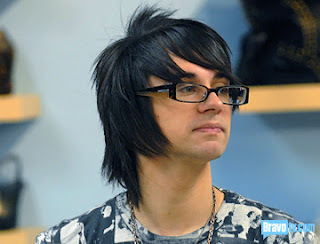 Project Runway ON the Runway! So apparently Project Runway's Fashion Week show happened a couple of days ago, and now it's all over the internets! Is this how it usually happens? Shouldn't there be an element of surprise on how the designers' final looks turn out? I wouldn't know from past seasons, I was usually too busy with school to notice or too broke and without cable/ a TV to watch new episodes when they were still new. Anyway, my favorite designer (Jillian) and my favorite person (Mr. Christian Soriano, pictured) fared really well, but see for yourself before the actual episode airs if you dare. AMNY has commentary with video, and Bravo has video of all the shows in their entirety. Gnarls Barkley's St. Elsewhere was a musical accomplishment unlike anything I'd heard before. Dangermouse's sleek and colorful production alongside Cee-lo's tortured words and salty croon was a perfect, if unexpected, match. The title of the duo's upcoming sophomore release reflects the unlikely pair's winsome chemistry. It sounds like Cee-Lo is a preacher in the Church of Bad Psychology with his forceful diction and the school kids' choir echoing his words in the background. 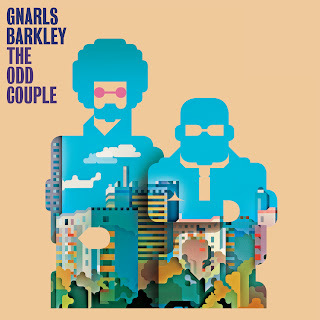 Gnarls Barkley's new album, the Odd Couple, is due out in stores in April. Gawker had a great post last night about "Movies That Made You Want to be a Journalist," and included one of my all-time favorites, Broadcast News. Joan Cusack is hilarious, and have you ever tried to mimic Holly Hunter and say "BobbyBobbyBobbyBobbyBobby" repeatedly without taking a breath? It's really hard! You can watch clips from other films on the list, including His Girl Friday and Network here.